December 2006. Herman Düne release their Giant album on a major label and are all set to play some large venues when suddenly André leaves the band. He moves to Berlin where, at his own pace and with no outside pressures, he starts to record new material under the name Stanley Brinks. 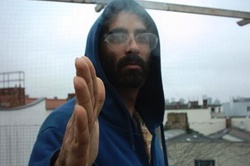 But this more personal approach to music started many years ago for Stanley/André, when in paralllel with his musical output with Herman Düne, he played solo gigs under his real name, or using the acronym AHD or even under one of a host of pseudonyms he'd taken (Ben Dope, Ben Haschish, Klaus Bong, John Trawling, John Andreas, Lord Stanislas...). Stanley/André has always been rather reticent when it comes to engaging with technology, the internet or the music business. In complete autonomy, he produces around 4 albums a year, on his own label, Radical Baboon. This solitary approach has never precluded him achieving worldwide recognition, since in the past he's often toured his work around Europe, the UK and the United states to an appreciative audience. By following this path, Stanley has managed to transform his ambitions to create music on a more personal scale into a veritable way of life: simple recordings that require little in the way of technical logistics, intimate live shows in small venues or even private appartments... a bohemian life of creativity and travel. His first album under the name Stanley Brinks, Dank U, was included in Inrocks top 50 best albms of 2008. And more recently, Stanley Brinks and the Wave Picture also elicited a strong critical response in the media. These are the only two albums which are officially distributed. All his other material is available either here, or at any concert Stanley plays.